**Disclosure: We received complimentary tickets to Illumination. No compensation was received. All opinions are 100% my own. Last night, we visited the Morton Arboretum to take in their newest offering for this holiday season-- Illumination! Since the temperature was a little warm last night, it was the perfect evening for the event! When we arrived, we quickly realized that hundreds of our closest friends also had the same idea. Fortunately, the Arboretum is so large that you barely notice a crowd and whenever I see a crowd at my favorite places, I smile! I love to see that other people enjoy the treasures I find as well! 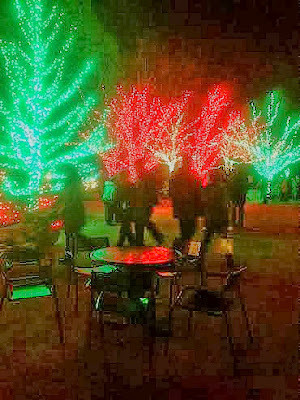 Immediately when you enter the Arboretum, you will see that the patio is brilliantly lit up and abuzz with activity. There is a vending area where you can purchase light refreshments as well as glowing items for the kiddos. Don't miss the fire pit for a little warmth! You can even buy s'mores kits to have a fun treat! The patio is quite pretty and you will be charmed as you gather your party for your trip through Illumination! As you wander along the path around the pond, you will notice that the island is brilliantly lit up. 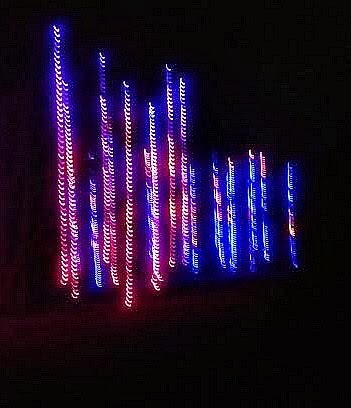 Rather than a light display that is stationary, the lights are always moving about the trees in different patterns! Below, you will see a section where changing colors were streaming down the trees! There are various points of interaction along the way including places where you can sing to the trees, hug a tree and see your reflection in the trees! 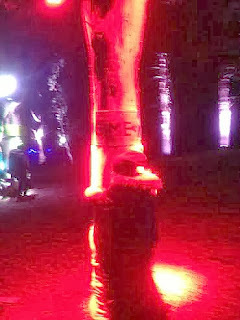 Last night, guests appeared particularly enthralled by the reflections in the trees, so that area got a little crowded. Truly fun to see! My daughter really enjoyed her chance to hug a tree! Throughout the display, you will notice suggested spots for photos. 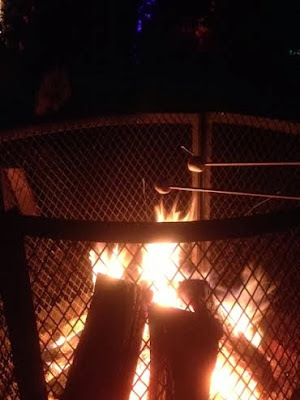 There also are two areas where you can purchase light snacks, warm up at a fire and even make s'mores. We delighted in making s'mores along the way! There is a shuttle if you need to park at the further parking lot. However, the wait for a shuttle may be a little long and you may prefer to walk. I brought a hot tea with me to keep me warm along the walk. You will want to take pictures. However, it may be difficult in the evening, so see if there is an app you can download to your phone to help with nighttime pictures. Purchasing your tickets before hand will help you bypass the line to purchases tickets at the event. The Arboretum Gift Shop is full of wonderful gifts and many selections are made in America--which you do not see often! Definitely, stop by for a looksie. Once you are in the line to go through the attraction, you are in the line. I recommend going to the bathroom first either before you leave home or once you get to the Visitor's Center. Watch out for people stopping to look at the wonders. Some will stop dead in front of you. Since it is dark, it may be hard to see them, so just be on the look out! The Enchanted Railroad is open during this event and I highly recommend taking a peek. The detail of the railroad is quite intriguing, so you will enjoy it! Read about our visit last year. Illumination was a magical way to begin the holiday season! The Arboretum has created an innovative way to entertain the senses. What a beautiful and peaceful way to begin this season of warmth and light! 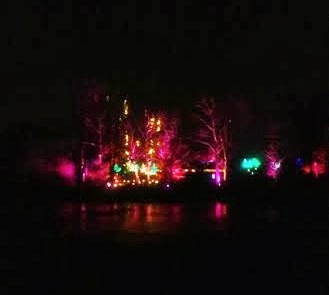 Illumination is at the Morton Arboretum through January 4th. The attraction opens at 4:30PM with last entry at 8:30PM each day. (Event closed November 28, December 2, 9, 16, 24, 25). Tickets are $15 per adult, $10 per child (2-17) or $10 per adult member and $5 per member child. Tickets include daily admission to Arboretum, order tickets online.